Coverage: Live on BBC Radio Wales, online, mobile, the BBC Sport app and Connected TV. 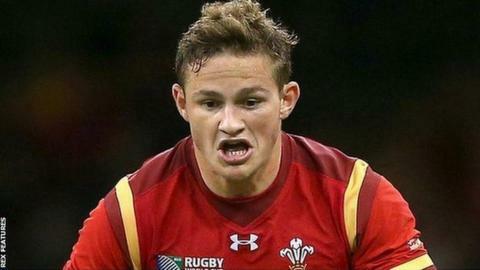 Wales coach Warren Gatland says he sees the future of Newport Gwent Dragons Hallam Amos mainly at full-back. Amos has been released from Six Nations duty and is at wing for Dragons against Ulster in the Pro12 on Friday. It will be his fourth game since recovering from a shoulder dislocation at the 2015 World Cup. "He can cover on the wing and does play there, but we do see his long-term position being full-back," said New Zealander Gatland. Amos was out for four months after injuring his shoulder in Wales's win over England in the World Cup in October. He made his comeback from injury in Dragons' European Challenge Cup win over Castres in January and has played in two further games. George North and the returning Tom James will start on the wings in Wales' Six Nations opener against Ireland on Sunday with Alex Cuthbert a replacement. Amos has started the last three games on the Dragons as a wing, scoring a try less than a minute into his comeback against Castres. Dragons director of rugby Lyn Jones has touted him as Wales's best wing option opposite North. "[We see him] having the opportunity of improving that left foot of his, because he's quick, but he's not international wing quick. "That opportunity to move him to full-back and potentially play a bit more there, that's the plan for the future." The Dragons have Carl Meyer and Rhys Jones as specialist full-backs, while five-times capped Tom Prydie can also play wing and full-back. While Amos faces Ulster, fellow Wales squad members Dominic Day and Ross Moriarty could clash when Bath host Gloucester on Friday night. Lock Day starts for Bath while back-rower Gloucester's Moriarty is on the bench for the Aviva Premiership game.